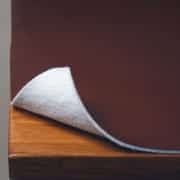 We offer heavy-duty felt-backed heat-resistant table protectors as well as luxury white vinyl table protectors with a fleece backing. They’re available in brown, grey, cream, black and white in standard and extra-wide widths, so can be positioned discreetly beneath any colour tablecloth. 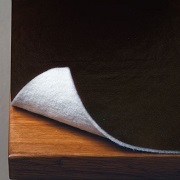 All of our table protectors are made-to-measure, so you can be sure of a neat finished look. Take care when measuring your table! 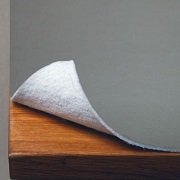 Unlike measuring your table for a tablecloth where you need to allow for an overhang, a table protector looks best if it’s cut to the exact dimensions of your table. 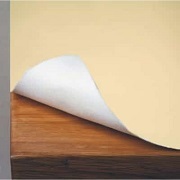 So, follow these instructions when measuring your table for a heat-resistant table protector. Simply measure the length and width exactly and provide these measurements when placing your order. Measure the diameter of your table, taking care to pass through the exact centre of your table. Please note that we do not provide table protectors for oval-shaped tables. If you have an oval-shaped table you will need to order a rectangular table protector. When you receive your table protector you will need to cut the material to fit the shape of your table. This is easy to do with a sharp pair of scissors and a little patience! Our heavy-duty table protectors are resistant to temperatures up to 100°C while luxury table protectors are heat resistant up to 80°C. We would advise the use of trivets and heat-resistant table mats alongside your table cover for added protection. A table protector will not only protect your table against heat damage, it will also help reduce scratches and marks.